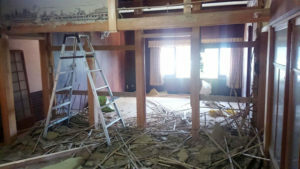 Following the last timemy blog,It is about DIY renovation of traditional Japanese houses. 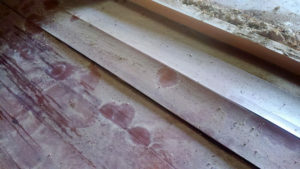 I wrote in the last this blog that I started removing the traditional Japanese mud wall (Picture below). 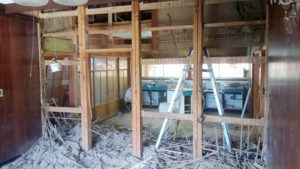 This is a renovation that removes the walls of the two rooms to make it one large room. I was thinking that it is easy to get rid of the walls. And I was thinking easy about the structure of traditional Japanese architecture. 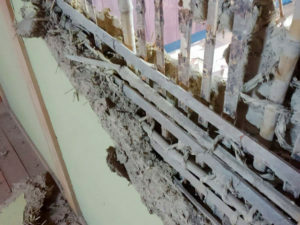 It is made by mud kneaded with straw over the complicated bamboo framework. It is hard work to break it off without using a machine and carry waste materials. 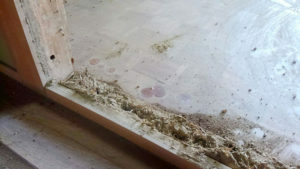 Besides, I have to work in a lot of dust. I removed the wall over three days in such a situation. I feel a decline in my physical strength as I am older. 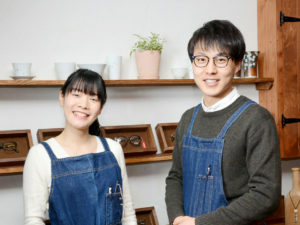 It was very hard to do this work by myself. I’m exhausted. As soon as I finished it, I found something on the floor. I looked up at the top. Then the roof was dripping. 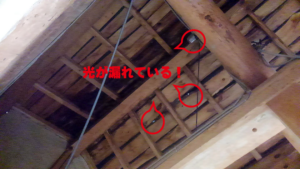 Moreover, there are holes in the roof,outside lights come in from there. 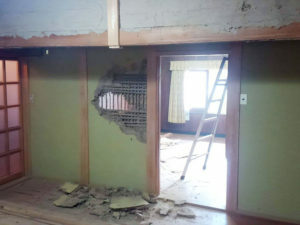 When I removed the wall, I removed the ceiling too, so I could see the roof directly. So I was able to discover roof holes. There was rain stain on the ceiling, but I did not think there was such a big hole in the roof. I do not know for better or worse that I found holes in the roof. Just！ good grief ！ Now, what shall I do? I need time to think about measures.